For a more detailed description of this product, please read below. Bioflavonoid Antioxidants is a dietary supplement providing antioxidant bioflavonoids derived from natural sources. Each tablet supplies a combination of citrus bioflavonoids rich in quercetin and its glycoside, rutin. Bioflavonoid (also called flavonoid) is a class of phyto-nutrients that are potent antioxidants, which scavenge many potentially damaging free radicals. Free radicals are unstable chemicals formed in the body during metabolism and from exposure to environmental sources, such as pollution and cigarette smoke. Free radicals are produced during energy metabolism and are necessary for immune function, but when an excessive number of free radicals are formed, they can attack healthy cells, especially their membrane lipids and proteins. This, in turn, is thought to contribute to a degradation of the structure and function of these cellular components. Another aspect of the antioxidant properties of bioflavonoid is their synergy with vitamin C. Bioflavonoids are also capable of binding to metal ions, which prevents these metals from acting as catalysts in the body to enhance free radical production. Many bioflavonoids, especially rutin and quercetin, support the health of the body’s circulatory system by helping maintain capillary blood flow and proper vascular permeability, integrity, and resiliency. Bioflavonoids are also involved in a wide array of other biochemical functions, such as immune function, platelet aggregation, enzyme activity, and the healthy metabolism of collagen, cholesterol, and histamine. 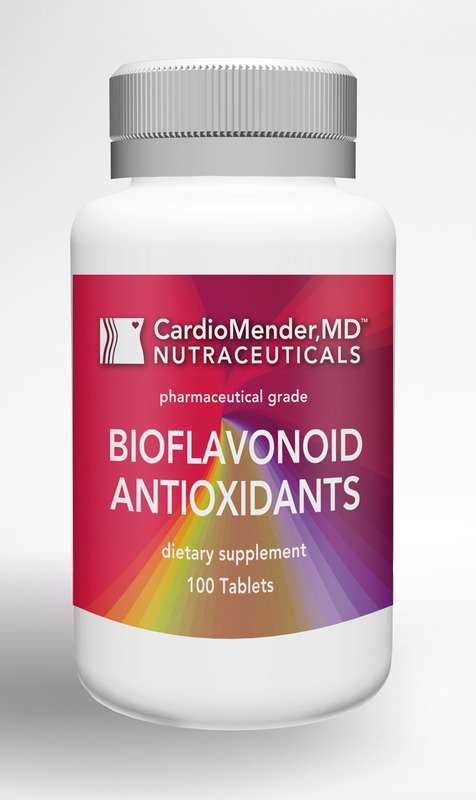 Bioflavonoid Antioxidants may be taken as a dietary supplement for individuals who wish to increase their intake of nutritionally important bioflavonoid. Adults take one tablet daily or as directed by your healthcare professional. Afanas’ev IB, Ostrachovitch EA, Abramova NE, Korkina LG. Different antioxidant activities of bioflavonoid rutin in normal and iron-overloading rats. Biochem Pharmacol 1995;50:627-35. Bors W, Michel C, Schikora S. Interaction of flavonoids with ascorbate and determination of their univalent redox potentials: a pulse radiolysis study. Free Radic Biol Med 1995;19:45-52. Conquer JA, Maiani G, Azzini E, Raguzzini A, Holub BJ. Supplementation with quercetin markedly increases plasma quercetin concentration without effect on selected risk factors for heart disease in healthy subjects. J Nutr 1998;128:593-7.
de Whalley CV, Rankin SM, Hoult JR, Jessup W, Leake DS. Flavonoids inhibit the oxidative modification of low density lipoproteins by macrophages. Biochem Pharmacol 1990;39:1743-50. Ferrandina G, Almadori G, Maggiano N, Lanza P, Ferlini C, Cattani P, Piantelli M, Scambia G, Ranelletti FO. Growth-inhibitory effect of tamoxifen and quercetin and presence of type II estrogen binding sites in human laryngeal cancer cell lines and primary laryngeal tumors. Int J Cancer 1998;77:747-54. Grinberg LN, Rachmilewitz EA, Newmark H. Protective effects of rutin against hemoglobin oxidation. Biochem Pharmacol 1994;48:643-9. Hertog MG, Feskens EJ, Hollman PC, Katan MB, Kromhout D. Dietary antioxidant flavonoids and risk of coronary heart disease: the Zutphen Elderly Study. Lancet 1993;342:1007-11. Hertog MG, Hollman PC, Katan MB, Kromhout D. Intake of potentially anticarcinogenic flavonoids and their determinants in adults in The Netherlands. Nutr Cancer 1993;20:21-9. Hirano T, Gotoh M, Oka K. Natural flavonoids and lignans are potent cytostatic agents against human leukemic HL-60 cells. Life Sci 1994;55:1061-9. Keli SO, Hertog MG, Feskens EJ, Kromhout D. Dietary flavonoids, antioxidant vitamins, and incidence of stroke: the Zutphen study. Arch Intern Med 1996;156:637-42. Lee SC, Kuan CY, Yang CC, Yang SD. Bioflavonoids commonly and potently induce tyrosine dephosphorylation/inactivation of oncogenic proline-directed protein kinase FA in human prostate carcinoma cells. Anticancer Res 1998;18:1117-21. Manach C, Morand C, Texier O, Favier ML, Agullo G, Demigne C, Regerat F, Remesy C. Quercetin metabolites in plasma of rats fed diets containing rutin or quercetin. J Nutr 1995;125:1911-22. Middleton E, Jr. Effect of plant flavonoids on immune and inflammatory cell function. Adv Exp Med Biol 1998;439:175-82. Negre-Salvayre A, Mabile L, Delchambre J, Salvayre R. alpha-Tocopherol, ascorbic acid, and rutin inhibit synergistically the copper-promoted LDL oxidation and the cytotoxicity of oxidized LDL to cultured endothelial cells. Biol Trace Elem Res 1995;47:81-91. Rice-Evans CA, Miller NJ, Bolwell PG, Bramley PM, Pridham JB. The relative antioxidant activities of plant-derived polyphenolic flavonoids. Free Radic Res 1995;22:375-83. Saija A, Scalese M, Lanza M, Marzullo D, Bonina F, Castelli F. Flavonoids as antioxidant agents: importance of their interaction with biomembranes. Free Radic Biol Med 1995;19:481-6. Schmitt A, Salvayre R, Delchambre J, Negre-Salvayre A. Prevention by alpha-tocopherol and rutin of glutathione and ATP depletion induced by oxidized LDL in cultured endothelial cells. Br J Pharmacol 1995;116:1985-90.